This feature is currently in private beta. Ask the support to have early access. You might want to read first the page about scaling an application. The autoscaling feature lets you scale automatically your application up and down, depending on a user-defined threshold on the application metric. The Target is used by the autoscaler to adapt the number of containers of your application. We also provide you with a recommended value you can use as the target. This recommended value is based on the median over the last 24 hours of your application for most metrics. It is 90% for the CPU and the RAM usage. Scalingo’s autoscaler service bases its decisions on a user defined metric (e.g. RPM per container, response time, CPU consumption…). When creating a new autoscaling, a target is provided. Our algorithm tries to keep the metric as close to the target as possible by scaling up or down the application. 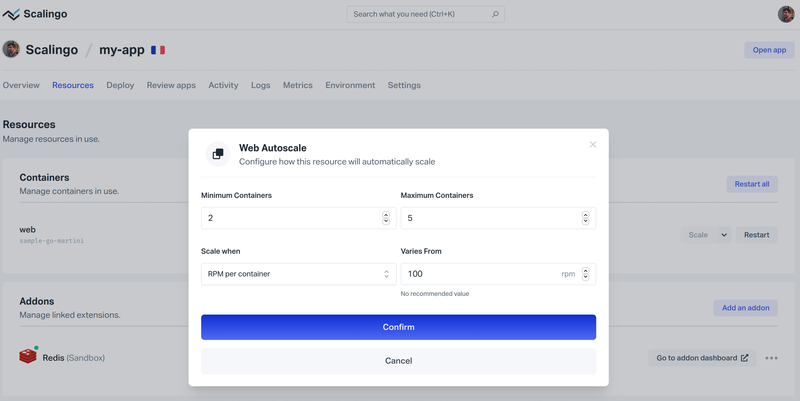 The autoscaler only scale the application up or down by one container. After a scale event, the autoscaler will not scale the application up again before at least one minute. The scale down is a bit less aggressive with a three minutes cooldown. These cooldown values prevent the autoscaler to scale the application frantically. and RPM per container: if your application has multiple web containers, it is the RPM divided by the number of containers. The last three metrics are only available for web containers. Every time an application is scaled by the autoscaler, an event is created. This event appears on the application’s timeline. The user responsible for the operation is labeled scalingo-platform-autoscaler. Notifications for such events are sent if you set it up in the Notifications section. A guide to configure these notifications is available here. A memory leak in your application. The database uses all its resources. In such cases, configuring an autoscaler will not improve the responsiveness of the application. One should investigate these issues before enabling an autoscaler.